I truly had good intentions of finishing the all the garments planned for holiday gift-giving. However, along with the lesion on my thyroid gland, another nodule/lesion has been found in one of my lungs. So for the next 2 weeks or so, I will be ping-ponging between yet more doctors and hospitals...for CT scans, consults, etc, etc, and a probable biopsy of the mass to determine if it is malignant. I am not in any acute pain, but am experiencing discomfort and some anxiety. 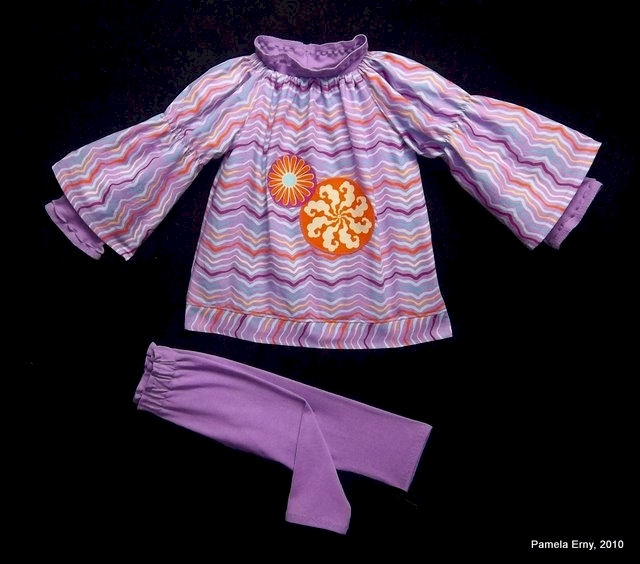 Any sewing that I will be doing will just be simple whimsical children's garments to keep my mind occupied between medical appointment days. I am very anxious to sew the new Colette Menswear Shirt, and perhaps I'll have the energy to at least start it...I hope so! 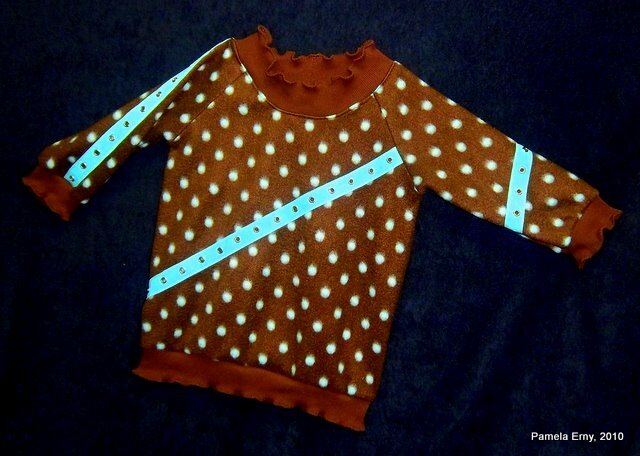 For adults or children, this a fun way to add some textural interest to a plain hem on any garment made with stretchy knit fabric ! 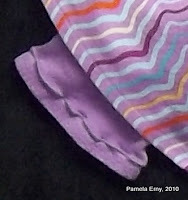 Here is a close-up of the sleeve hem of the knit under-Top pictured above, made for my 4-yr old friend Julianna. So I will show you the steps I used to achieve this effect using contrasting colors in the samples below. These samples have been done on flat pieces of fabric, however it it best to do this treatment "in the round" on an actual garment. 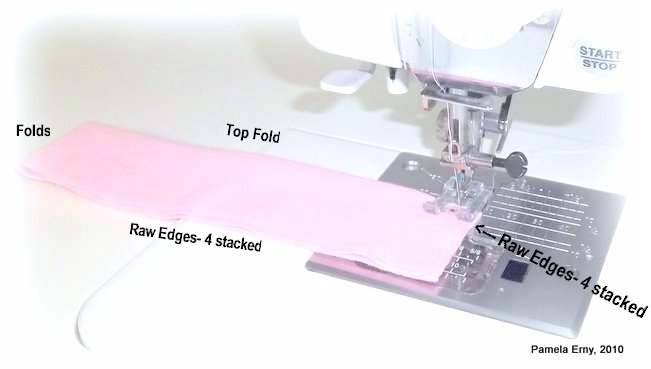 Now using a sewing machine or serger, "lettuce" the fold by stretching it while zig-zag stitching or serger-stitching along the fold. It will look something like this after "stretching and stitching." 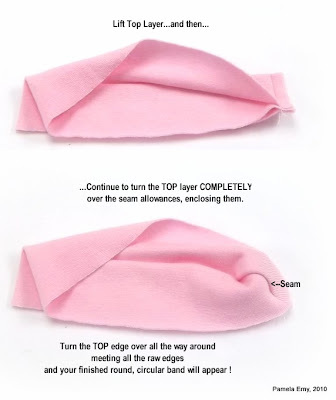 Now turn back the hem into its normal position, and admire your new Textured Decorative Hem ! I have used highly contrasting colors. I am in the midst of a full-blown Holiday Gift Giving Sewing Panic! While I am working on the shirt, I'll also be preparing the fabric and cutting out the pieces of a Coat for my sister Carolyn...her birthday is Christmas day :) Along with being an accomplished medical professional, my sister is now a business woman! She has recently started to sell the fabulous jewelry line, Silpada. So I think the casual yet classy coat from McCalls that you see pictured will be perfect for her as she travels here and there to showcase all that amazing jewelry. I am making it from camel wool/cashmere knit that has been aging in my stash for a while. The only snag I can see about making this coat for my sister is that she is very petite....5' 1" tall and about 95 pounds. Luckily, our sleeve length and shoulder length is the same, so I should be able to scale down and shorten the smallest size (8) without too much trouble, and I will also reduce the flare a bit so the coat won't overwhelm her. The gift that has a definite deadline is the one I making for the young mother who "lets" me sew for her 2 little girls! Jill is a sweet 26-year old beautiful young lady and a wonderful mother, who is always ready and willing to help me when I am ill...and she brings her little girls to visit me frequently :) That means alot to me because I have no children of my own, and I get to play "grandma" when they are here! 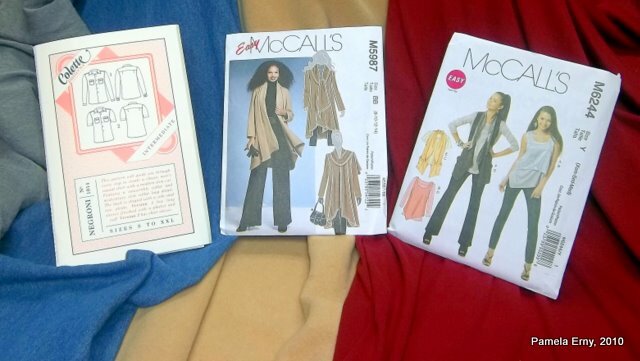 I plan to make a top for her from matte jersey and the "swing vest" with the McCalls pattern shown on the right using the dark red microfiber suede pictured above. She is a tiny little thing but I think the x-small size will fit, based on her measurements. To add to it all, our new Pro-Tricot Deluxe Interfacing has just arrived at Fashion Sewing Supply ! I have been developing this new interfacing for the past several months, and it is fantastic...I mean really really nice. 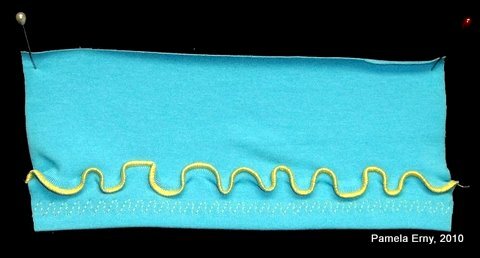 I am so excited and proud of this new interfacing :) Made especially for knits, it has stretch both width and lengthwise due to a touch of lycra and a special knit weave. Our new Pro-Tricot Deluxe comes in 4 colors, it doesn't shrink at all, leaves the knit fabrics to which it is applied very soft/drapey, plus the fabric remains stretchy yet stabilized and completely machine washable. Whew..so many great features. This is not your typical tricot interfacing! So, let the merry panic begin! But as that slogan we've seen all over the place says, I'll just...Stay Calm and Sew On ! Whether casual or dressy, made with self-fabric or ribbing...it is all too easy for a Stretch Neckband to end up looking "wonky" because the layers have shifted while being sewn to the neckline. 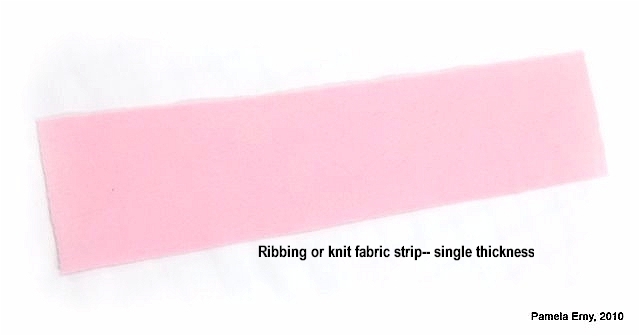 Keeping the seamed edges of a Stretch Neckband completely straight and stable while sewing it to the neckline can be tricky...especially with slippery knits ! 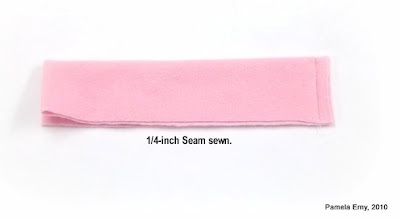 After you have determined how wide and long to make your Stretch Neckband (be it from a pattern piece, or your own design preference), it will look something like this example below...a single thickness of knit fabric. 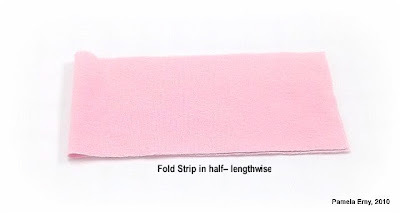 The next step is to fold the strip in half, Right Sides Together so that the short ends meet, as shown below. Usually, this is when we would sew the Back Seam of the Neckband, by stitching the short raw edges closed to form a circle (loop). But the next step is where this method differs from the norm. 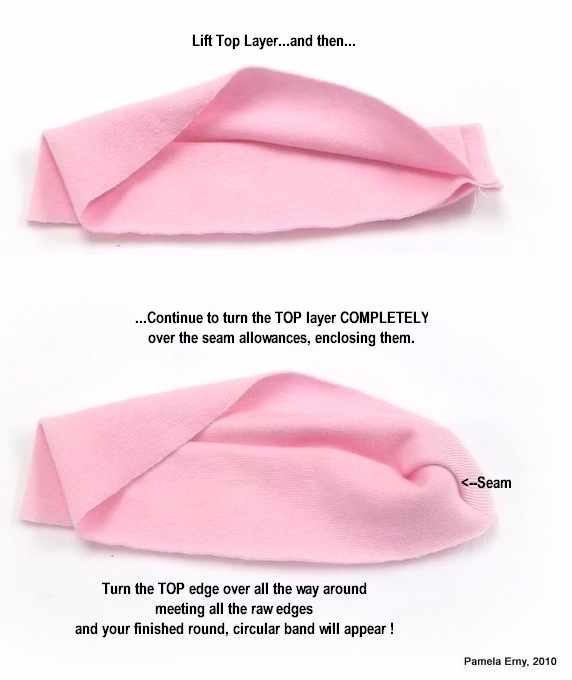 Next, fold the entire strip in half again...this time from the top down. 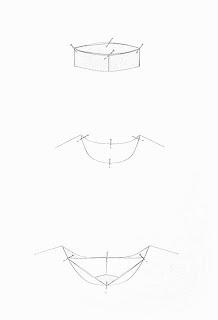 After making this fold you will have 4 (longer) raw edge layers that meet, 4 (short) raw edge layers that meet, and 2 folded ends that meet, as shown below. Now take your folded Neckband Strip to the sewing machine, and stitch a seam starting from the TOP fold, through all four stacked short layers, as shown in the next 2 photos below. In this example I am using a 1/4-inch seam allowance. We now have a twice-folded Neckband piece, that has had the 4 (short) layers seamed together. As a result, we also now have 4 layers of seam allowance. At this point, you can choose to grade the seam by trimming the 2 inner seam allowances. If I decide to grade this seam, I trim the 2 inner seam allowance layers by about half their width. Now...finally...you will see the point of the extra fold and stitching those 4 stacked short edges together! 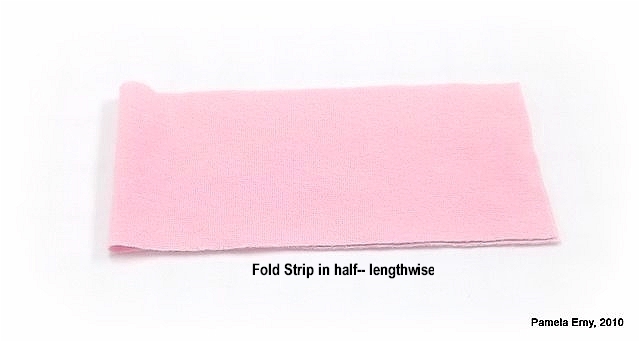 After the top edge is turned (flipped) over the seam allowances and all the raw edges meet, your Stretch Collar Band is ready to be sewn to the neckline of your garment. The folded back seam allowances have been "locked" together by the stitching that was done, and now will not shift or slip when being sewn to the garment...yay! 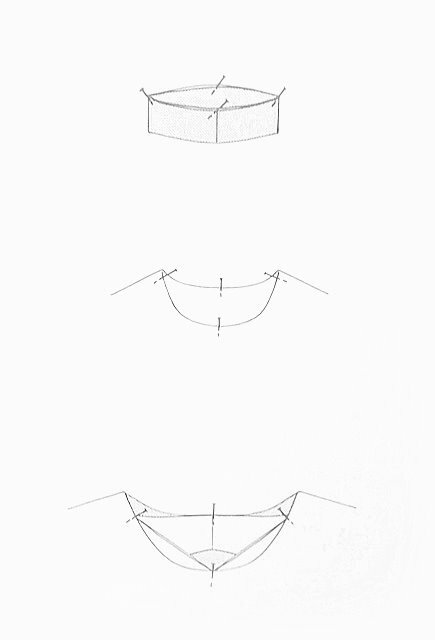 QUICK REVIEW--The following sketch illustrates the usual way a Stretch Neckline Band is sewn to the neckline of a garment. From top to bottom: 1. Quarter-mark the raw edges of the Stretch Neckband, using the Center-Back Seam as one of the marks. 2. Quarter-mark the neckline edge of the Garment. 3. With right sides together, match the marks of the Stretch Neckband to the marks of the neckline, then sew the Neckline Band to garment...stretching the Neckline Band to fit the neckline edge.